One winner will receive the 12 piece China Glaze Anchors Away Collection, which is scheduled for a January release. Same rules as always! *Send me an eMail (mej0620@hotmail.com) with the words ANCHORS AWAY in the subject line. Include your first name and last initial or last name in the eMail. *Contest ends 12/31/10 at midnight. This collection is due out in January, so as soon as Victoria Nail Supply receives their order in, the winner should expect their prize package shortly thereafter. The winner will be announced 1/3/11. Thnak you for the opportunity. This is such an amazing giveaway! I like so many colors from this, I can't decide which one's my favorite! Thank you ! Amazing!!!! U´ve got a mail!!! amazingly nice of you to do this... email sent. You are THE best blogger :) So generous to your readers! I sent an email. This is so nice! 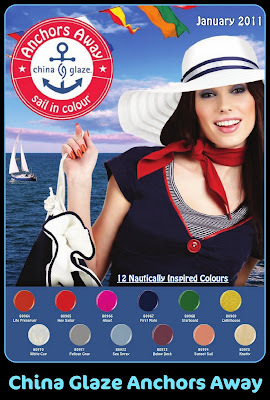 Thank you for the giveaway, BUT also thank you for keeping us updated with china glaze's new releases =] !! thats such an awsome giveaway! i entered :D i cant wait for this collection to be out. Akuma Kanji~yep! Just send me an eMail with "Anchors Away" as the subject line, and make sure to include your name in the body of the eMail. this is an awesome giveaway!!! so ready for this collection!!! Cool website I'm now a Fan !! Thank you for this great GA! So generous Mary, thank you. I'm sending the email right now. Thanks for the generosity! I follow on GFC. This is a great giveaway. This is an amazing giveaway!! I love reading your blog. It's nice to get information on products or collection but also very nice that you share private things with us! Wow this looks awesome! Sent an email and thanks so much for the chance! wow you are very generous!!! hope you got my email. I follow via GFC as malkatz. Emailing you now. I had to double check and make sure I signed up. ^_^ Can't wait for the winner! I'm wishing.... I'm hoping....! What a great give away! Wow i love the colors in this set!